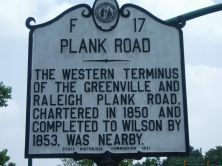 The western terminus of the Greenville and Raleigh Plank Road, chartered in 1850 and completed to Wilson by 1853, was nearby. The plank road movement in North Carolina came to fruition in the late 1840s. In a message to the legislature in 1848, Governor William A. Graham argued for the “indispensable necessity of improving our public roads,” claiming the state’s existing system was so bad that “that we labor under greater disadvantages than any State in the Union.” In the antebellum period, the state had only occasionally taken a role in road building or upkeep. Those duties had been the responsibility of local officials who often used an outdated labor tax method for roadbuilding. Since the only resources available to the road overseer were the labor of the road hands and the right to cut timber, little progress was ever made. Private, chartered companies had built some of the primary arteries such as the Buncombe Turnpike. As early as 1842, Governor John Motley Morehead had proposed construction of a road providing transportation from Fayetteville into western North Carolina along the route of the proposed, and failed, Fayetteville and Western Railroad. Plank roads had first been used in Canada in 1836, and had gained popularity in the Northern states. In 1849, shortly after Graham’s plea to the legislature, North Carolina chartered its first plank road along a route surveyed done by University of North Carolina Professor Elisha Mitchell, stretching from Fayetteville to Raleigh west and eventually to Georgia. Enthusiasm for such projects grew in subsequent years, with thirty-nine bills introduced for plank road charters in 1852, and thirty-two granted between 1854 and 1855. The support for such ventures often divided by party line. About three-fourths of Whigs supported the charters while about three-fourths of the Democrats opposed them. The reasons for such division lay mainly in the rights to land, and decisions on where the roads would actually pass. 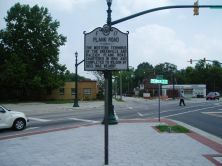 By 1860, nearly 500 miles of plank road had been laid in North Carolina. Fayetteville served as a central hub for the system, with five outgoing branches. The longest stretch was the Fayetteville-Western Road that stretched 129 miles from Fayetteville to present-day High Point and on to Salem with side courses that passed through Spout Springs and Gulf, as well as a route that ran from Cameron to Carthage to Asheboro. Jonathan Worth and Francis Fries served as company officers and financiers. Other plank roads ran from Clinton to Warsaw and from Greenville to Wilson. A triangular route linked Lincolnton, Charlotte, and Salisbury. Two interstate routes ran from Yanceyville into Virginia and from Wadesboro into South Carolina. The process for chartering a road involved the creation of a plank road company. Typically, a group of entrepreneurs, often the community’s elite, elected a set of officers. Those individuals then established construction plans and began soliciting investors by subscription to cover the costs. Once ten to twenty-five percent of the starting capital was raised, the company could be officially incorporated under state law. The election of a board of directors to overlook construction and the stockholders’s money, followed. The massive wave of enthusiasm for the plank road system waned shortly after construction began. The creation of such roads proved to be more difficult than most investors had anticipated. Workers first graded a roadbed and then elevated the center of the road for water drainage. Next, wooden sills typically measuring five feet by eight feet were placed as a support. Pine planks measuring approximately eight feet long, eight inches wide and four inches thick were then laid on top of the sills. State laws required the roads to be a minimum of eight feet and a maximum of sixty feet wide, and that a secondary maintained dirt road run alongside. The plank roads were to be used by heavy freight and teamsters, while lighter carriages as well as individual riders and walkers would use the side road. Construction time varied, depending on a number of factors including the skill of the work crew, typically numbering fifteen men, the accessibility of materials, and, of course, the weather. On average, a team could lay 650 feet a day, or about one mile a week. Given the vagaries of the weather, one crew could be expected to put down forty miles in a year. The exact number of men who took part in the road building, and the actual methods of their recruitment remain unknown. The securing and maintenance of financing also posed significant problems. Tollbooths were established along the roads to help pay for their construction. On one road, one rider on horseback paid one-half cent per mile, a teamster with two horses paid two cents per mile, a teamster with three horses three cents, and one with six horses four cents. Despite the initial enthusiasm for them, the plank roads were doomed from their very beginnings. Timing was terrible. In 1856, the North Carolina Railroad connected the mountains with the coast. Competing with a faster, easier to maintain form of transportation was impossible. Companies never were able to raise enough funds from the use of tolls, as travelers would simply use country paths to go around them. The high costs of maintenance, combined with the nationwide economic panics of 1854 and 1857, also forced potential investors away. The outbreak of the Civil War eliminated any further state efforts to support their construction.